Josh Brown/Troy Daily News Troy’s Gracie Huffman races down the stretch during the 400 finals at the Division I state track and field meet Saturday at Jesse Owens Memorial Stadium in Columbus. Josh Brown/Troy Daily News Troy’s Kelsey Walters breaks the Troy High School record in the shot put on her second throw at the Division I state meet in Columbus Saturday. Josh Brown/Troy Daily News Troy freshman Morgan Gigandet runs in a pack in the 3,200 at the Division I state meet in Columbus Saturday. COLUMBUS — It was never Gracie Huffman’s intention to the be the best. Ironic then, that is exactly how she’ll be remembered. Saturday’s meet served as more of a victory lap — fitting it was in the 400, exactly one lap around the track — for Huffman, who now will leave Troy with a list of records that will be difficult to match. For starters, she broke her own school record in the 400 (57.06 seconds), giving her five individual or relay school records, more than any other athlete in school history. Just by appearing at the state meet, she became the first female athlete in school history to do so four times. 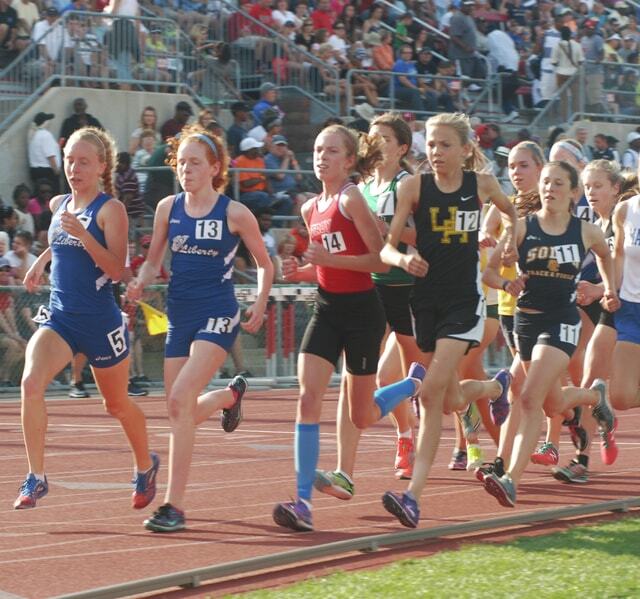 She also became the first athlete in school history to place at the state meet four years in a row. For her career, she earned five medals at state, placing in the 4×200 as a freshman, the 4×100 and 4×400 as a sophomore, the 4×100 last year and the 400 this year. In coach Kurt Snyder’s mind, her legacy at Troy is set in granite. “She’s the best,” Snyder said. While it would appear Huffman gave all she had to the Troy program, however, she chose to look at things from the opposite point of view. And she had fun the entire way. * Gigandet Places Seventh: As the book closed on one record-setting career for a Troy girls runner, Morgan Gigandet was writing the first chapter in the next. Gigandet, a freshman, placed seventh in the 3,200 (10:59.79), breaking her own school record and laying the groundwork to join Huffman as the only two four-time state qualifiers and four-time state placers. As impressive as Gigandet already is, however, the sky would appear to be the limit for the wispy freshman. Saturday’s race was only the sixth time in her career Gigandet has ever run the 3,200. * Walters Gets Record: Troy’s Kelsey Walters fell just short of getting on the podium in the shot put — but still managed to pick up the best possible consolation prize. The junior uncorked the heave of a lifetime on her second throw, recording a 38-9.5, good for 10th place overall — not quite enough to make the nine-thrower final, but still good enough to break the school record of 38-3.5, set by Danielle Wertz in 2001. Walters had been approaching the school record all season, but finally was able to get it at the biggest meet of the year. Not only did Walters snare the school record, she came within four throws of making the finals. Ranked No. 15 out of 16 throwers coming into the state meet, Walters finished seventh in her flight. During the second flight, thrower after thrower fell short of Walters’ mark. Going into the third and final throw for the second flight, Walters was sitting at ninth overall. With just four shot putters left, Mason’s Amaya King was able to pass Walters — along with a host of other throwers — pushing her out of the finals.